These "guns" are solid blocks of expertly molded, brightly colored plastic or rubber-like material. They cannot fire or function as guns in any way other than described below. Authentic replica of Glock 19 automatic pistol weighs 11.4 ounces. Perfect for any kind of simulation or training including draw scenarios. New, the Glock 19 and 17 Generation 4 is available. These items are limited for sale to Police, Military, Trainers, Police Distributors, or Holster Manufacturers. This product is a detailed replica of the actual weapons designed specifically for Law Enforcement and Military Training. Each fake gun is made with strong, impact-resistant polyurethane with steel reinforcement. This prevents bending and flexing while maintaining the detail, handling and balance of the actual weapon. 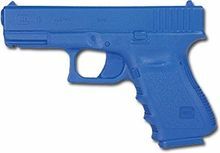 Each gun is fabricated in "Law Enforcement Blue" - the most recognized safety color in the world. Note: We feature flat rate shipping for $7.95 for your entire order. Temporarily Out of stock of these models: "FSG19 Gen4" "FSG17 Glock 17" and "FSG19 Glock 19"
Arrived on time and product was as described by seller. Love it. I train with it ,I've taken it to the store with me to buy things like holsters. Fits perfect in my holster and is an exact replica of my Glock 17.